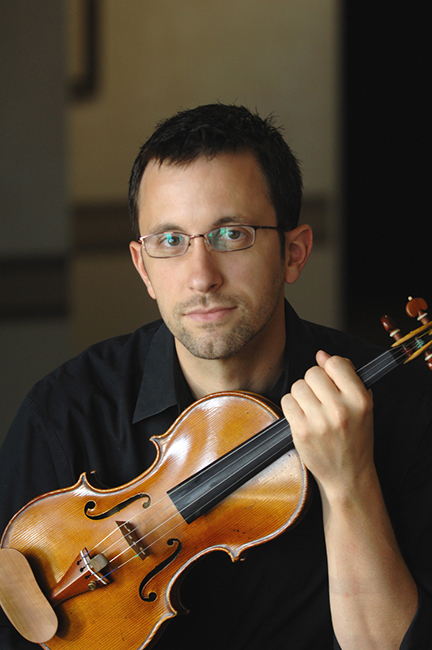 As a founding member and second violinist of the Euclid Quartet, Jacob Murphy has captivated audiences and critics at venues ranging from Carnegie Hall to school classrooms to radio and television broadcasts. The highlights of his quartet career include significant international recognition as a member of the only American string quartet to be awarded a top prize at the prestigious Osaka International Chamber Music Competition since 1993. Prior to this victory in Japan, he and his quartet-mates also won numerous competitions in the US, such as the Hugo Kauder International Competition for String Quartets and the Carmel Chamber Music Competition. More recently, the quartet was awarded the prominent "American Masterpieces" grant from the National Endowment for the Arts. Raised in a small collection of towns, he claims Fresno, CA as his home town. He began his violin studies at the age of 6 and soon earned acclaim as soloist with the Kings Symphony Orchestra and the Fresno Youth Philharmonic Orchestra. He was also a recipient of the Fresno Arts Council Horizon Award for Outstanding Contribution to the Arts. He continued his studies at the Eastman School of Music and Kent State University. Jacob is currently on the faculty of the Ernestine M. Raclin School of the Arts at Indiana University South Bend, where he teaches violin and chamber music. Commercial recordings featuring his playing are available on Centaur Records and Artek Recordings. Jacob has also been involved with recordings on the other side of the microphone. On top of being an accomplished chamber musician, he has also used his knowledge of audio technology to record, edit, and master numerous recordings for the Euclid Quartet.